or any other name for colourful designs with and without dots for celebration of this important festival in a grand manner necessitates inclusion of rangoli / muggu also. 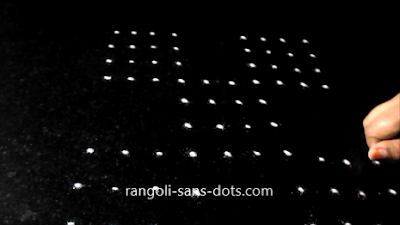 Though it is a small design with 5 to 3 dot pattern, I have included a lot of pictures to show the step by step procedure . Instead of drawing with white rangoli and filling with colors , I have directly tried with various colour rangoli , after all we have to be or try to be innovative in rangoli , we are creative because drawing rangoli itself demands creativity. 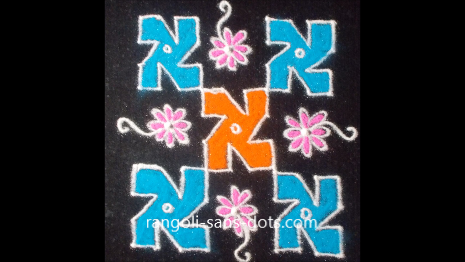 The next rangoli is a square rangoli pattern that is commonly found in Maharastra , my sisters live in Nagpur and Mumbai so I am familiar with some of these designs. This theme is also a very beautiful way of Diwali decoration of our homes. The dot pattern used is 4 by 4 . On the four corners of this dot grid four more 4 by 4 dot grids are placed ( in the outermost row and column only 3 dots will be there because the 4th dot will be common ) After drawing the same type of pattern in all the four dot grids colours are filled and the gaps decorated with simple floral patterns . We can stop at this step are proceed further to decorate the outer lines of all the five similar patterns with a cotton bud. Light a diya at the centre of each pattern or outside to complete the simple decoration for Diwali . 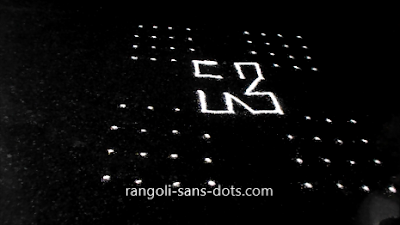 This is a 7 by 7 dot grid ( square rangoli designs theme like Maharastrian rangoli with dots ) that I created for Diwali 2016 ( this post has been updated ). It is a simple and also not so easy rangoli. I have added deepam or diya patterns at the corners to make it suitable as diya rangoli designs for Diwali or deepam kolam for Karthigai Deepam. The images should help learn step by step this rangoli. 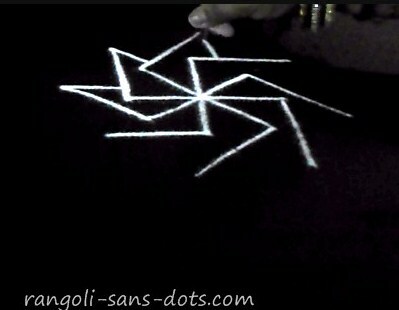 Occasionally we should try something different , some techniques that are different from the traditional method of creating rangoli. My sister in Mumbai , over phone discussed the rangoli designs - methods that are practised in Maharastra. They use a variety of tools for creating rangoli that are innovative in nature. 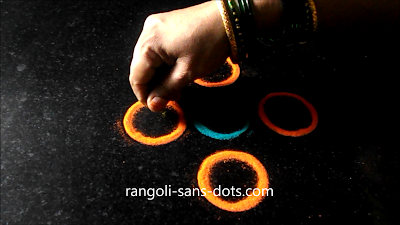 This rangoli shown in steps has been created using the bangles , cotton buds and fingers technique of creating colourful designs. 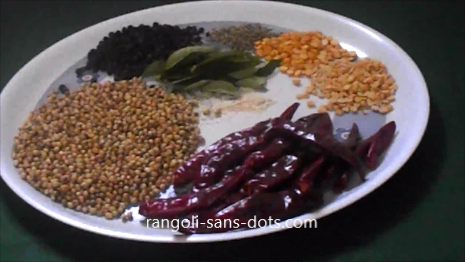 Hope the step by step pictures will be useful for Diwali decoration of your homes in 2016. 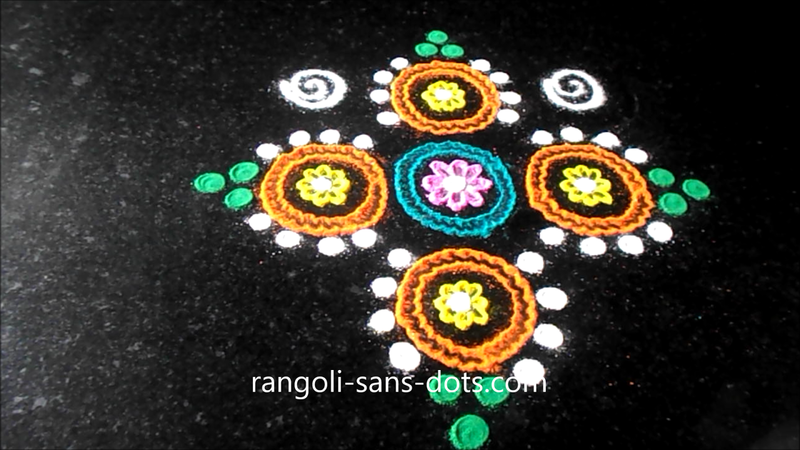 These rangoli designs particularly the one at the bottom make use of the diya pattern to emphasise its importance in the context of Diwali celebrations. The one at the top also is a diya (or deepam rangoli) design. In Tamil Nadu apart from Deepavali (as it is called) lighting of lamps is given most importance during Karthigai Deepam festival. - two simple colourful rangoli designs to welcome Diwali . 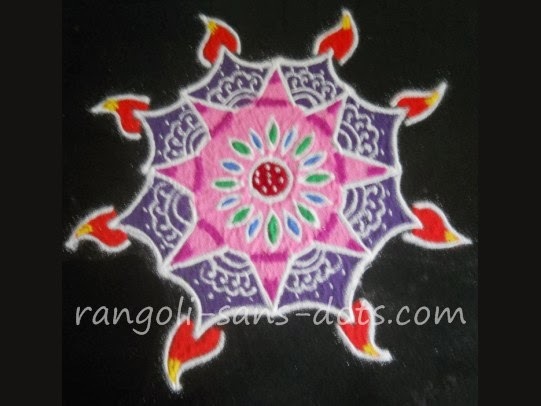 The first one above is a free hand rangoli for Diwali. 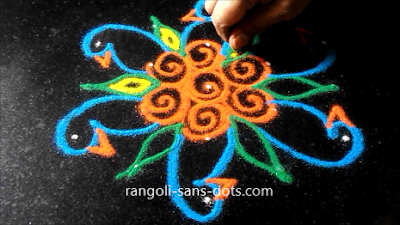 Diwali is a joyous occasion and it is natural to find many colourful rangolis during this season. 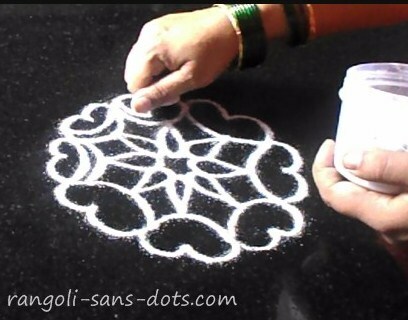 In Tamil Nadu simple kolams are drawn every day at the threshold- in some homes both in the morning and evening but during Margazhi rangoli is given a lot of importance. 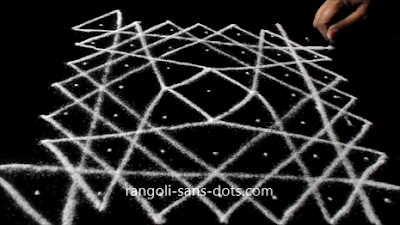 We find beautiful rangolis drawn every day for one month during Margazhi. 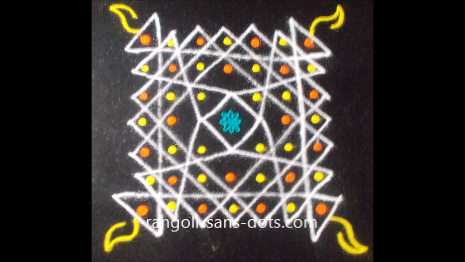 Coming to this image, the central sikku kolam like design is drawn - I placed the dots after drawing the design - and is surrounded with the designs along the circumference. 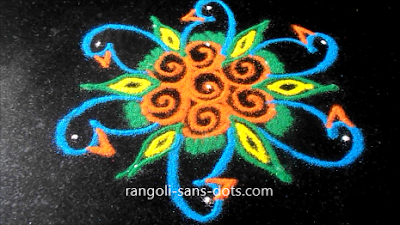 Finally the rangoli is filled with bright colours and to depict the lamps I used brown colour so that I could get a different type of diya rangoli. The second image above is also a diya rangoli. First the central floral design is drawn and then decorated with various designs as shown in the image. 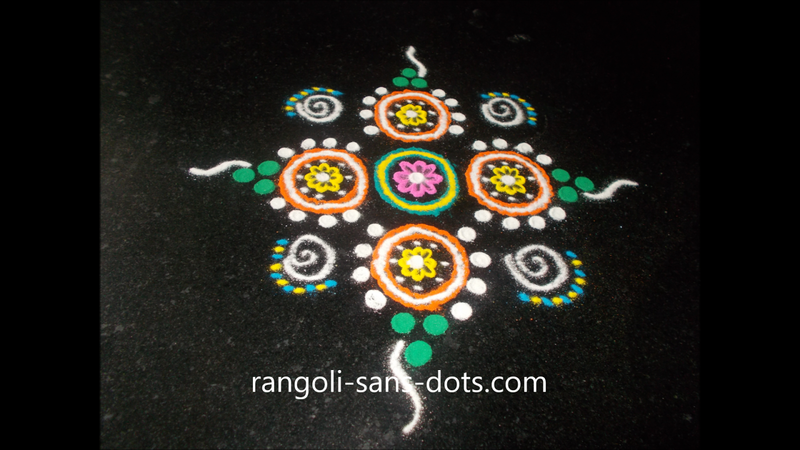 Finally it is filled with bright colours yellow, pink, red to get this beautiful rangoli. 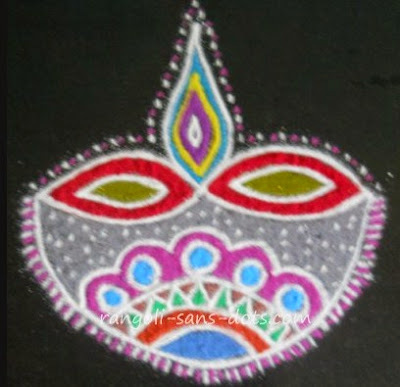 Again the lamps are shown along the periphery (pink colour) as in the previous one to get the diya rangoli. 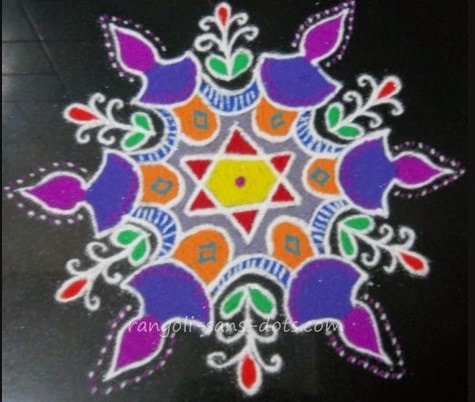 This colourful kolam can be drawn to show off (!) for Sankranti kolam designs also. 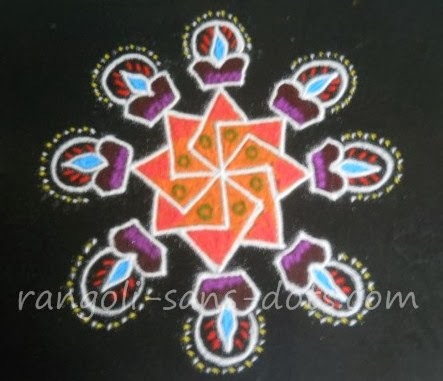 Sankranti or Pongal is the most important festival after 30 days of kolam drawing for Margazhi and naturally we would like to draw beautiful and colourful designs. 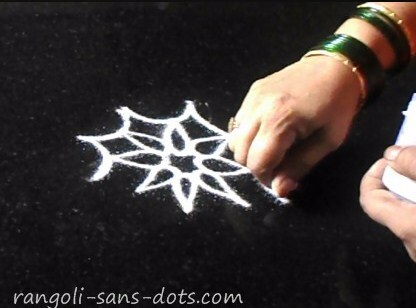 Of course there is New Year kolam during Margazhi kolam season. The above two are not the usual diya rangolis that are drawn, they are just simple free hand rangolis evolved in such a way that a part of the design resembles diyas. It is easier to achieve this on the circumference of these rangolis given the nature of the designs. I think there is a relation or connection between rangolis and mandala (intricate designs that have religious and spiritual significance). The designs above due the circular nature of the patterns and the symmetry probably are similar to some simple mandalas. Yes? 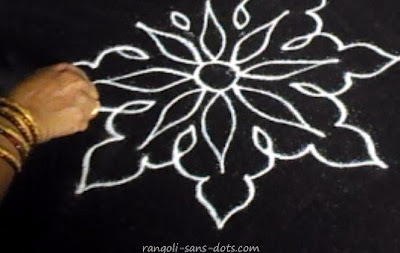 The rangoli above, diya rangoli for Diwali 2012. A free hand rangoli true to the name Rangoli-sans-dots. The star design is drawn at the centre with a single line. Then one additional line is drawn parallel to the lines in the star to get the image of the star above with two lines. There are six edges to the star. 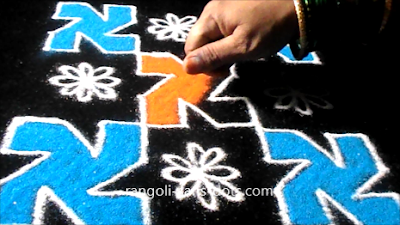 On the top of each edge a beautiful and colourful diya is drawn as shown. 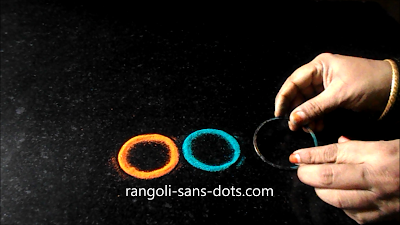 The diya is filled with bright colours like red and green as bright colours are associated with Diwali rangolis. The wick of the lamp is also filled with red colour. I use orange, yellow or red colours for the wicks. The gaps between the lamps is filled with floral motifs with three petals each. 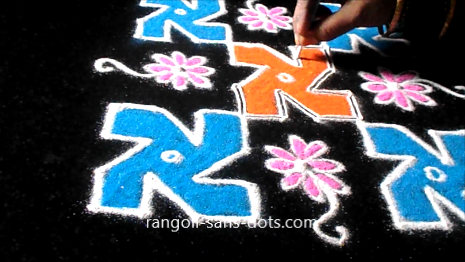 Small white lines around the wick improve the image of the diya rangoli. If required the remaining gaps in the black background can be filled with a rangoli ( powder ) of our choice, if we have time to spare. 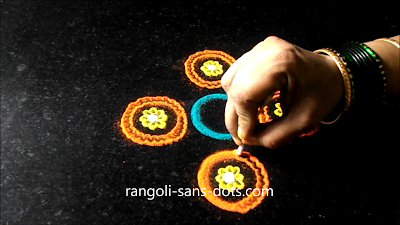 The idea is to draw diya rangoli but to draw something different so that diyas are an integral part of the rangoli and are not separate from the rangoli. 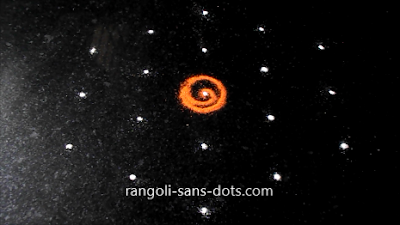 I think I have achieved some degree of success in the rangoli above. The design at the centre is expanded with simple geometric patterns and the gaps between are evolved into diyas. So we get eight diyas in our rangoli. 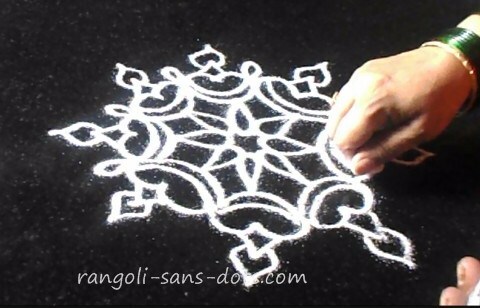 White rangoli powder is used to draw some simple designs to identify the diyas. Further red and yellow colours are used for the wicks of the diyas to complete the design. The remaining area are filled with pink and blue colours. I have used two shades of pink, dark and light to enhance the effect. The central design is converted into a floral design. So here it is, a diya rangoli for Diwali. The second rangoli is simpler than the one above. The central floral design has some simple motifs, six numbers. 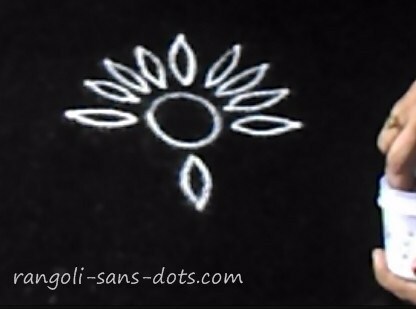 The gaps are also filled with similar motifs. On the periphery six diyas are drawn. The entire rangoli is first completed with white rangoli powder. Then green and pink colours are used for the central floral design. The motifs or branches are filled with blue, light green and red motifs. As usual the wicks of the lamps are filled with red colour rangoli powder. A simple diya rangoli for Deepavali. 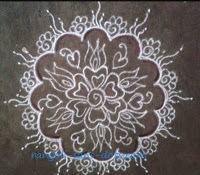 The kolam above, one of the few kolam designs drawn for Karthigai is with lamp designs - since Karthigai Deepam festival is associated with lamps. First the central star design is drawn and the gaps between the edges are decorated with free hand designs and finally the lamp designs are evolved from the free hand design. The gaps between the lamps are filled with floral or leaf motifs. 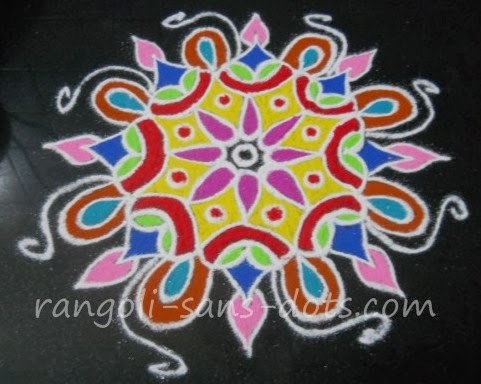 Then the rangoli is filled with bright colours pink, violet, orange and yellow to get the image shown above. To enhance the effect of the lamps (or to show that the lamps are present in the rangoli!) white rangoli powder is used around each lamp to place dots to show the lamps in the rangoli. 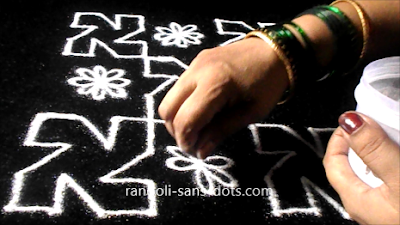 Finally white and green colours are used to draw some simple designs inside the rangoli to get the final image. This is the latest addition to this post on Deepam kolam but it is kolam without dots or free hand kolam. 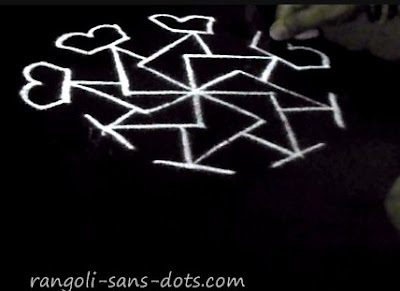 The steps are quite easy, draw a four intersecting lines meeting at a central point. 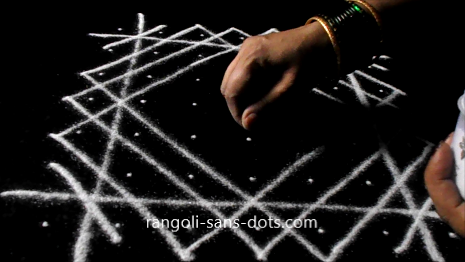 On the edges of the arms draw the now popular (in Rangoli-sans-dots ) elliptical patterns connecting the edges as shown. Add deepam designs in orange or red and yellow at the top. The centre has a few petals and curved patterns to depict a floral design. Fill the colours and the deepam kolam is ready for Karthigai. 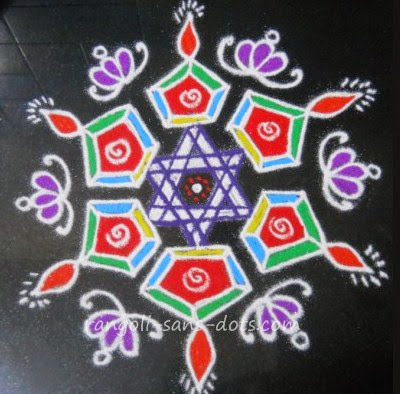 A circular deepam kolam design. ! There is a video on my YouTube channel for this design. A kolam for Karthigai Deepam. 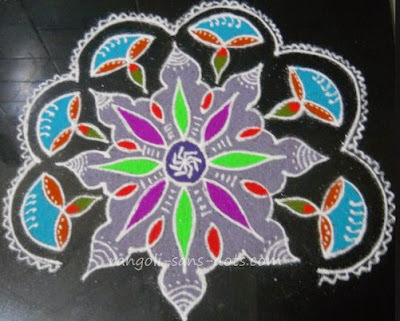 A simple design and similar to a rangoli drawn in an earlier post. 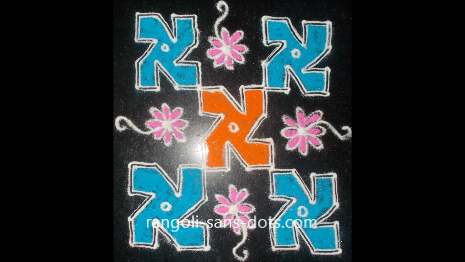 It is a simple freehand design with deepam and swastik. 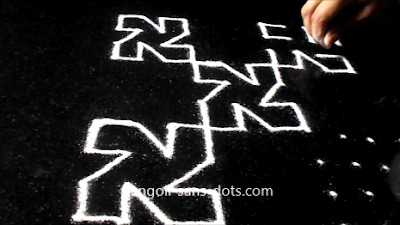 the black and white kolam photos show the intermediate steps. Freehand or rangoli with dots, swastik and deepam form an important role in an Indian rangoli. Draw a swastik at the centre, in fact there are two such patterns overlapping, an develop the pattern to get the central orange design. 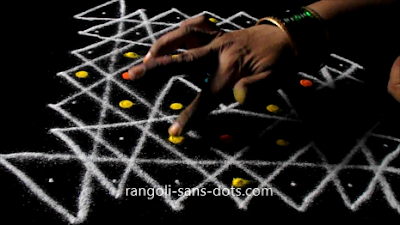 Now draw deepam or lamps on each edge of the geometric pattern obtained from evolving the rangoli. 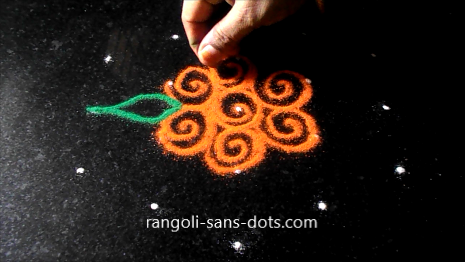 Fill the the centre with various hues of orange and to get the finish shown in the image, filling of rangoli powder is to be done with some patience. The deepam designs are decorated with small red lines and yellow dots to stress the importance of the deepam. It is also because flames are yellow, red or blue in colours. This is a freehand rangoli for Diwali (Deepavali in South India, particularly Tamil Nadu) season. 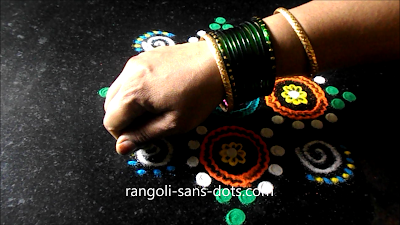 I am back to my inclination to use birds in my free hand rangoli. To reflect the mood of the current festival season, I have added a couple of diyas also. 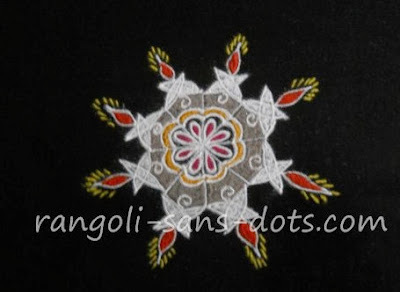 Obviously, this basic idea is to be decorated to complete the rangoli hence the flowers around the basic design. 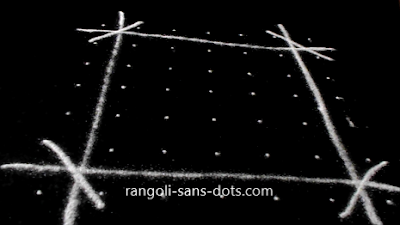 After a long time I have used 'used rangoli powder' to fill the vacant spaces in the design. For the benefit of viewers, used rangoli powder has been utilised (Oh no! 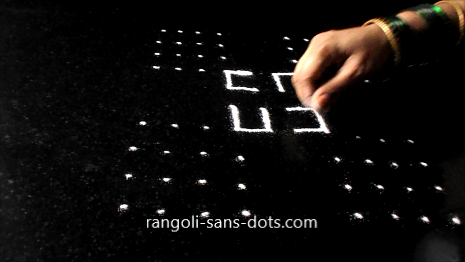 I have ..... the word "used" too many times in two sentences) in some rangoli designs in Rangoli-sans-dots. Two images below show steps to draw the central pattern. Draw the floral pattern first, and then surround it with the design shown in the image. The lamps are again decorated with simple rangoli border. The central floral petals, the floral design around it and the lamps are filled with colours as shown. The remaining gaps can also be filled (where the black background is visible) if time permits. 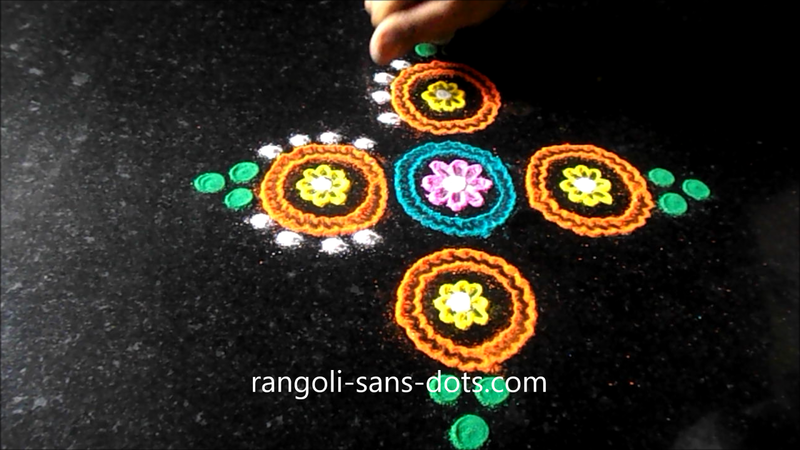 However the rangoli is beautiful (!) as it is . 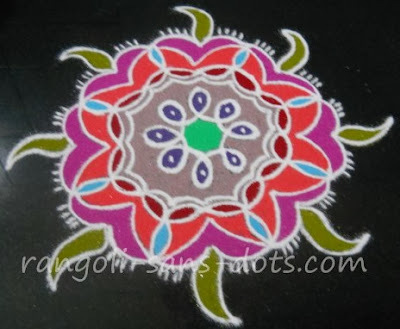 In the circle at the centre a swastik design is drawn and white rangoli powder is used to decorate the edges of the flowers, the lamps and between the pink and green petals. It took me quite some time to finish it. 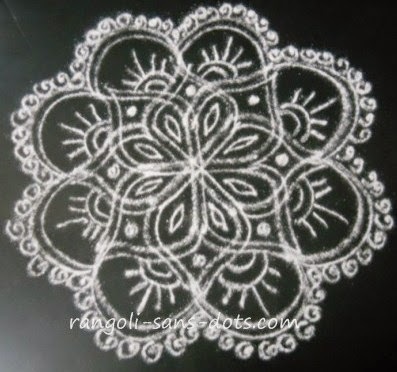 This is a free hand kolam for the Karthigai Deepam festival that will be celebrated next week. An important festival in Tamil Nadu. Like Deepavali, there is a practice of bursting crackers and lighting of deepams (oil lamps) for this festival also. Two kolam designs with double lines with a few colours added to them - I drew for Bharani deepam and Karthigai Deepam festival of 2014. The lamps lit are both the traditional earthen lamps and the modern battery operated lamps ( a fusion of the old and the new customs ). We use sesame (gingelly ) oil to light the lamps. 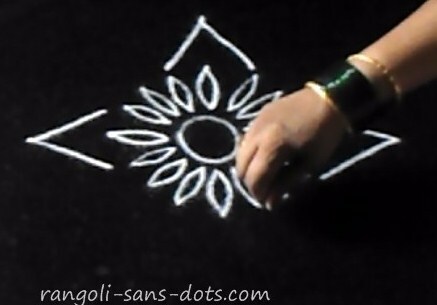 The next kolam rangoli in this theme is a single deepam kolam drawn free hand. Draw the basic outline of the lamp. 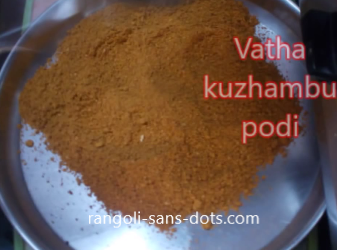 I have used yellow and orange colours for the deepam - red can also be used. Decorate the lamp with as many designs as you can. The outside has a pink pattern with white dots. 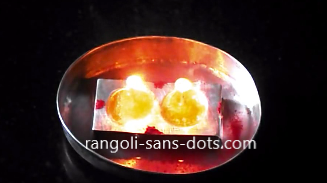 The deepam again has yellow and orange dots. 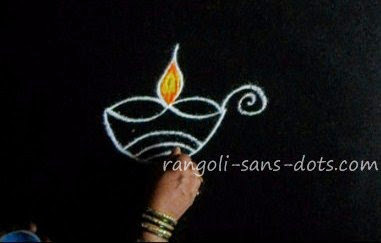 The next rangoli is a free hand lamp as Diwali is associated with lamps. 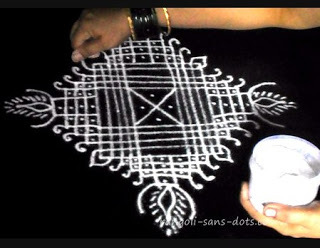 The basic design is drawn with white rangolir and then is decorated with different colours as shown. The outermost area is also decorated with white, pink and purple colours to get the final effect. 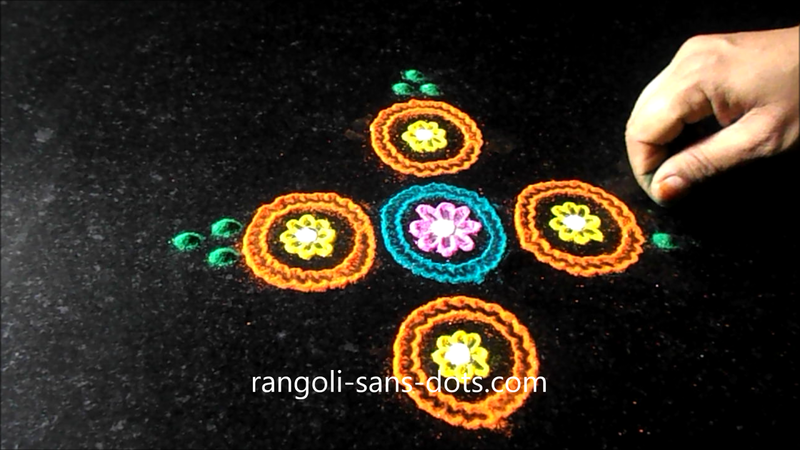 Diya rangoli and diya are ubiquitous during Diwali celebrations. What is the significance of lighting lamps for Diwali? 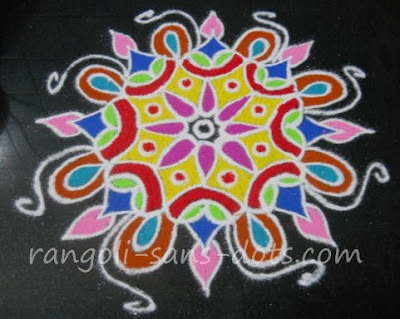 What is the importance of drawing colourful rangolis for Diwali, Dasara, Sankranti or any other festival? There may be many answers to these questions. I would like to give my opinion as a layperson. 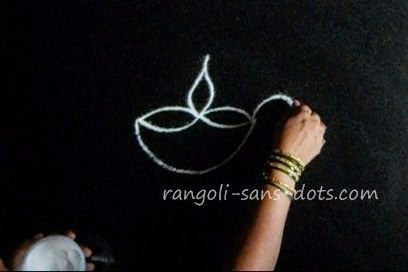 Lighting of lamps and drawing rangolis helps augment the positive spirit that I have during celebrations of a festival. It makes me happy and also gives a sense of satisfaction. After all even in basic mathematics a positive number added to another positive number only increases the value of the sum. Now that Navaratri and Dasara are behind us, the next festival of 2012 is Diwali (or Deepavali in southern India). 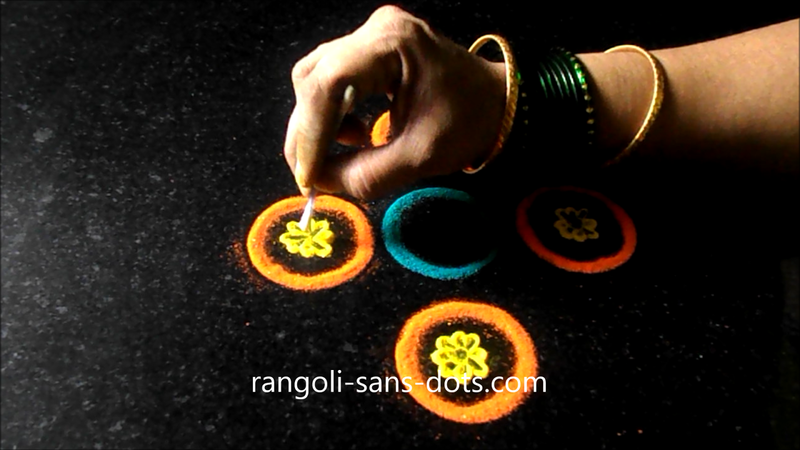 Diwali reminds us of crackers, new dresses, sweets and of course our rangolis. I may post one or two recipes for sweets. There is more than one reason for doing so. Diwali is the most joyous festival for children because they get new dresses, lots of crackers and a variety of eatable especially sweets. They also start the count down to the festival before sixty days! Some also start saving for crackers months before the festival. They start to prepare a list of crackers to be bought based on the price list only to find they are short of money for the entire list when the prices go up. I can share how it is celebrated by our family. 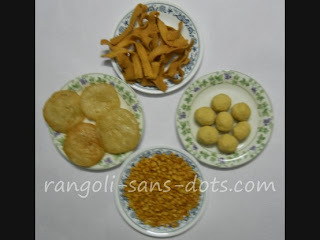 For us the Deepavali celebrations start from the previous evening (Diwali eve ). Children burst crackers from the evening and into the night. 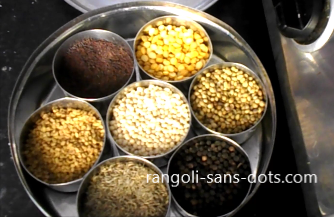 There is a special menu in the evening of Diwali eve. A big vessel called "handa" in Tamil is washed, a turmeric tied to its neck, and sandalwood paste, turmeric powder and kumkum is applied. A little quantity of water from the Ganges is filled in the vessel. 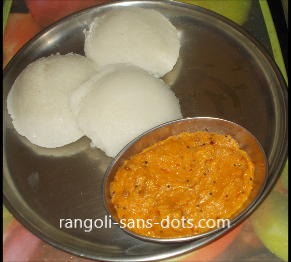 The menu for dinner is invariably vegetable pulav with raitha or shallots sambar, semiya payasam and pappad. On Diwali day early morning the elder ladies give the new dresses bought for the younger members, perform aarti, singing aarti songs (Aarti songs are in various languages including Tamil, Hindi, Telugu, Kannada, Marathi ) apply kumkum on the fore head and bless them (praying that they live long like the immortals Ashwathama, Balji, Vyasa, Hanuman, Vibhishana, Kripa, Parasurama, some use Markandeya instead of Kripa ) After that it is crackers, sweets prepared in the house, and from the neighbours. In the morning the blessings of the elder members of the family are sought and also of those relations who live near by. In the evening we go to the temple near by. 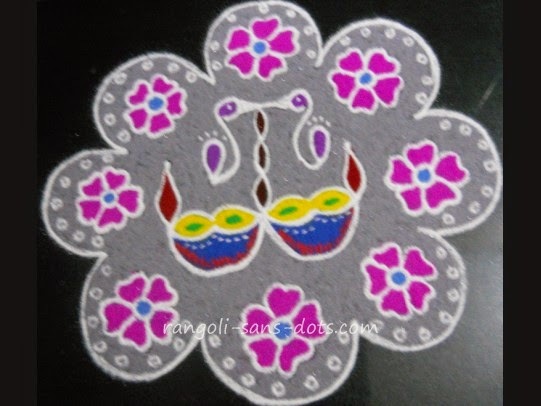 We also purchase a vastram for Ganapathi when we purchase dresses for ourselves. Preparation of Deepavali bakshanam as it is called starts a few days before. In the photo abovea sweet, besan laddu, ribbon pakkoda and boondhi prepared by me for Deepavali (2013). 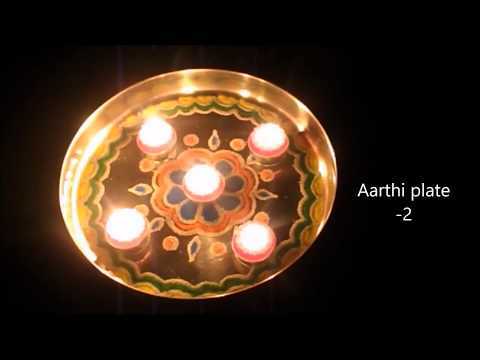 Diwali is a festival of lights and diyas (deepam) are synonymous with Diwali (Deepavali in Tamil Nadu). Another festival in Tamil Nadu that calls for celebrations similar to Diwali with crackers and lighting of lamps is Karthigai Deepam which comes after Diwali (usually within a month). Let us hope that everyone has a really cracking Diwali this year. 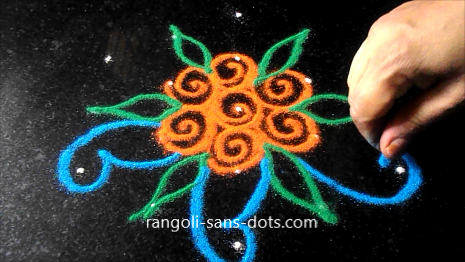 Some free hand rangoli for Diwali 2013. We have to wait till 2014 for the next Diwali. The night settles in with the sound and light of crackers reducing by the hour. The last cracker for this year's Diwali ignites and bursts with what appears to be a melancholic sound.